The New York Public Library has unveiled a $317 million Master Plan for its iconic Stephen A. Schwarzman Building. The plan calls for around a 20% increase in public space for research, exhibitions, and educational programs. Delft – November, 2016 – New Yorkers are getting their first look at a completely renovated, vastly improved Mid-Manhattan Library – The New York Public Library’s largest circulating branch – which is set to undergo a transformation that will increase seats, expand services, and add public space. 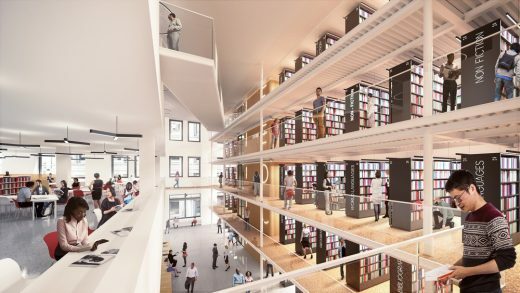 The largest public-private rehabilitation in NYPL’s history will create a new, state-of-the-art library that will serve as both a model and catalyst for a rejuvenated library system. The schematic designs released by The New York Public Library provides an early idea of what the Midtown branch will look like after a complete interior renovation, which is scheduled to begin in 2018. The project is much-needed at Mid-Manhattan, which opened in the 1970s in a space originally designed for a department store. The branch receives approximately 1.7 million visits annually and circulates approximately 2 million items each year. The renovated branch – located at Fifth Avenue and 40th Street – will have a dramatic, multi-storey wall of bookshelves; an employment skills centre occupying a full floor as well as an adjacent floor providing job-search help and small-business support; a full-floor dedicated to a library for children and a separate library for teens; the only free public roof terrace in Midtown; and hundreds more seats than the current branch. –	An over 100,000-square-foot facility, providing more public space than the current Mid-Manhattan Library and Science, Industry and Business Library combined. 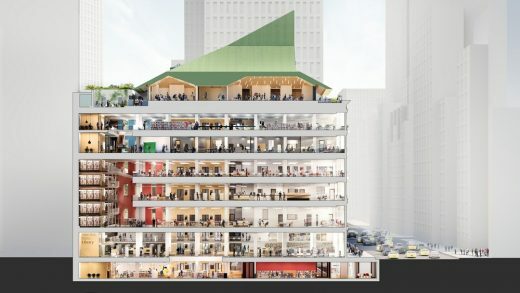 –	More public space (by 35 percent) than the current Mid-Manhattan Library, created by moving back-office staff out of multiple floors of the building to an adjacent facility; utilizing the roof to add an additional floor; and utilizing the lower level for the public (with a design that brings in light from the street level). –	Capacity for approximately 400,000 books and other circulating materials. –	A “Long Room” – the largest element in the new branch – offering five floors of open, browsable book stacks, and two floors of meeting rooms. The shelves will all be located on one side of the building, maximizing capacity and efficiency. –	The only rooftop terrace in Midtown that will be free and open to the public. –	A dedicated business library occupying an entire floor and offering the services and circulating collections of the Science, Industry and Business Library. –	An adult learning centre – one of the largest in the city – which will be adjacent to the business library and provide a seamless continuum of educational opportunities. –	A floor of dedicated space for children and teens; the current Mid-Manhattan does not have spaces for kids and teens. –	Approximately 17,000 square feet of general reading and study space – including seating for almost 1,500 library patrons, an increase of 30 percent over the combined capacity of the current Mid-Manhattan Library and Science, Industry and Business Library. –	Over 11,000-square-feet of multipurpose space that can be used for classes, events, one-on-one consultations, seminars, and a host of other programs, maximizing efficiency and diversity of public offerings. The new Mid-Manhattan Library will cost approximately $200 million, which includes a $150.7 million allocation for the project from New York City. The Library’s Board of Trustees approved the budget at its meeting tonight. The Library is currently fundraising for the project, as the remaining $50 million will come from private funds. Mid-Manhattan will temporarily close for construction in late 2017. The renovated building will also include a business library incorporating services and resources currently housed at the nearby Science, Industry, and Business Library, which is slated to move out of its current building once the new Mid-Manhattan is ready to open. During construction, to maintain the large variety of services currently available at Mid-Manhattan, NYPL will use a combination of four Midtown buildings: the Stephen A. Schwarzman Building, on Fifth Avenue and 42nd Street; Grand Central Library; the Science, Industry and Business Library; and 53rd Street Library. The Schwarzman Building – located across Fifth Avenue from Mid-Manhattan – will temporarily take in the primary functions of the branch, including its circulating collections, computer stations, and many of its public programs. 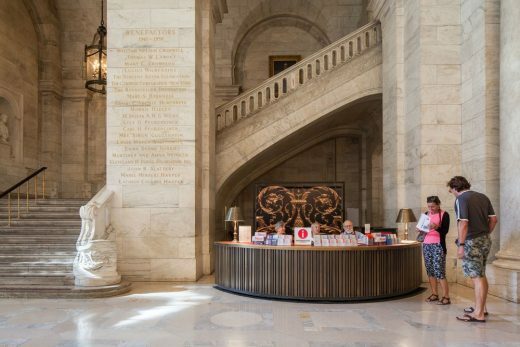 Over the past three years, NYPL has greatly increased public space in the Schwarzman Building by reclaiming for public use several rooms on multiple floors that had been either vacant or used by staff. The Mid-Manhattan Library services will be relocated to spaces on the Schwarzman Building’s ground floor in an area originally designed for public use. The Library will outfit the ground floor rooms with shelving, tables, and more, first as a temporary site for Mid-Manhattan services, and then for continued use by the public after the branch reopens. Construction on the ground floor space – work that will not impact service in the rest of the building – will begin in 2017. The Schwarzman Building will also become the permanent home for Mid-Manhattan’s Picture Collection. 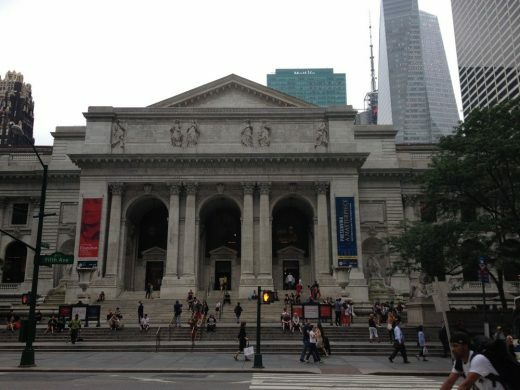 Grand Central Library will host Mid-Manhattan’s community resources, including IDNYC and SingleStop, while technology classes and programs will be moved to the Science, Industry and Business Library, which will remain open until the new Mid-Manhattan reopens.